Scientific-and-theoretical magazine for specialists, research workers, leading engineers and technologists, lecturers, instructors, postgraduates and students of higher educational institutes. It covers all industries of processing industry of agro-industrial complex. 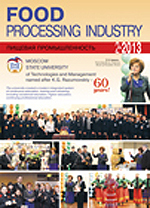 Published under aegis of Russian academy of Agricultural sciences. Issued monthly.